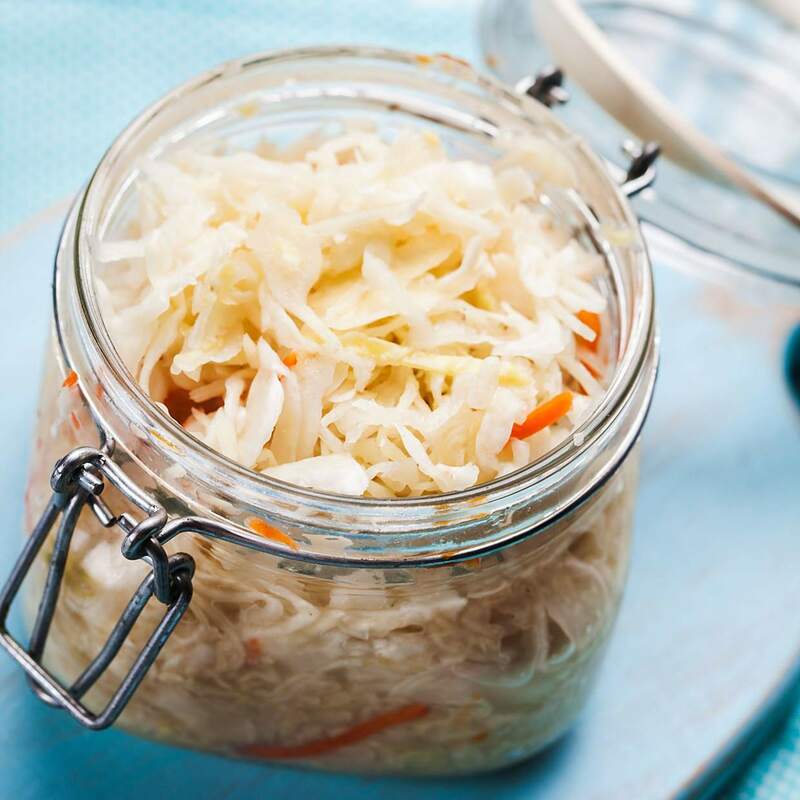 Fermented and cultured foods, like sauerkraut, are a great way to tip the scales in favor of a healthy microbiome. Editor’s note: For ideas and recipes to incorporate whole foods into your diet, pick up a copy of Wednesday’s High Life section. The food pyramid was long revered as the gold standard for nutritional health, although over the past decade, shakeups in research and skyrocketing health problems have led many in the medical and nutritional field to rethink how America thinks about food. While food classifications certainly play a part in divvying up our daily intake of calories, nutritionists and physicians are increasingly diversifying the more traditional framework of nutritional groupings in order to put more of an emphasis on what kinds of foods we’re eating within these groups, as opposed to how much of them we consume. Nutritionists and physicians are more frequently emphasizing larger umbrellas that cover processed and unprocessed foods as a means to saturate patients’ diets with “real” food — fruits, vegetables and whole grains. Processed foods generally come in bags or boxes and have been altered somehow from their original state, whether with additives and preservatives or by stripping the nutritional component from the original food, as in the case of refined carbohydrates. Even foods that often are advertised to be “low fat” or “low carb” can be complicated for consumers to digest both and can create internal problems. “They key is to increase the percentage of calories obtained from wholesome, nutrient-dense foods — the only diet that’s been scientifically proven to reverse heart disease is a nearly 100 percent whole-food, plant-based diet,” said Dr. Dennis Lipton, an internal medicine physician at Vail Valley Medical Center. The term “plant-based diet” gets tossed around in this niche of dietary guidelines, as well, although adhering to a plant-based diet similarly puts more of the emphasis on just that — eating a diet based on nutrient-dense fruits and vegetables and whole grains and avoiding refined carbs and fruits and veggies that have been altered with sweeteners, sodium or oils. Meat can certainly work its way into this diet, with moderation being the key, and the focus for any meat products being quality: good cuts from healthy livestock. What can muddle the main point of this dietary standard is when certain diets advocate giving up entire nutritional components — such as fat or carbs — as opposed to focusing on the quality of what dieters are eating. Christine Pierangeli, a certified master nutrition therapist at The Westin Riverfront Resort & Spa in Avon, explained that the biggest takeaway from different diet trends and talking points is to eat a diet full of unprocessed fruit, vegetables and whole grains — something that seems fairly intuitive but is increasingly being forgotten via the modern American diet. Looking more broadly at unprocessed food and largely plant-based diets, the classifications for foods within this umbrella are stocked with long-term health benefits. Leafy greens, in particular, are some of the most nutrient-dense foods, with other plant-based groupings, such as cruciferous vegetables — broccoli, cabbage and cauliflower — containing glucosinolates, which are converted into anti-cancer agents when digested. Even mushrooms and dried yeast have been shown to improve immune function. It might be easy to become fixated on a particular class of foods in this regard, but it’s important to dish up a variety in order to optimize health benefits. Penny Wilson, Ph.D., a registered dietician and nutritionist, said incorporating fermented foods into the diet is crucial for tipping the scales in favor of a healthy microbiome, which is crucial for hosting beneficial microorganisms to help with digestion and overall gastrointestinal health. There might be certain foods that seem daunting to tackle, but picking a new vegetable each week to try grilling, sautéing or baking can be an adventurous way to try a new recipe or spend a night at home. Natural spices can be a potent source of antioxidants and anti-inflammatory properties, and learning to work with or grow different herbs can offer a new taste and similar health benefits to old favorites, as well. Wilson advocates trying different cooking methods — even with whole, plant-based foods you didn’t like as a kid — as a means to work more unprocessed foods into the diet. Tweaking a few cooking methods can make a world of difference for certain veggies and create new menu favorites. Overall, the takeaway should be shopping for foods that don’t need labels to indicate their health values and getting the whole family involved in the food prep and cooking process to encourage healthy habits from a young age.